Transition to Trades Program Places 131st Soldier in Full-Time Plumbing, HVAC, and Electrical Careers – Transition to Trades | Moving troops from serving to service. Transition to Trades, an approved CSP Program developed by Hiller Plumbing, Heating, Cooling & Electrical and U.S. Army Garrison, Fort Campbell, proudly graduated its 210th soldier during its 5th Cohort graduation of the July, August, and September classes for HVAC, Electrical, and Plumbing trades. This program, launched on July 5, 2016, allows separating soldiers the opportunity to attend Total Tech trade school (a subsidiary of Hiller, LLC) to learn valuable technical career skills while remaining active duty in the U.S. Army. Total Tech offers a unique approach to technician training through classroom and hands-on laboratory instruction in a 15,000 square foot, state-of-the-art facility. As part of the program, students are guaranteed an employment interview at a branch location of their choosing. Soldiers desiring to return to their hometowns are provided key industry contact information to aid in employment searches in those respective areas. 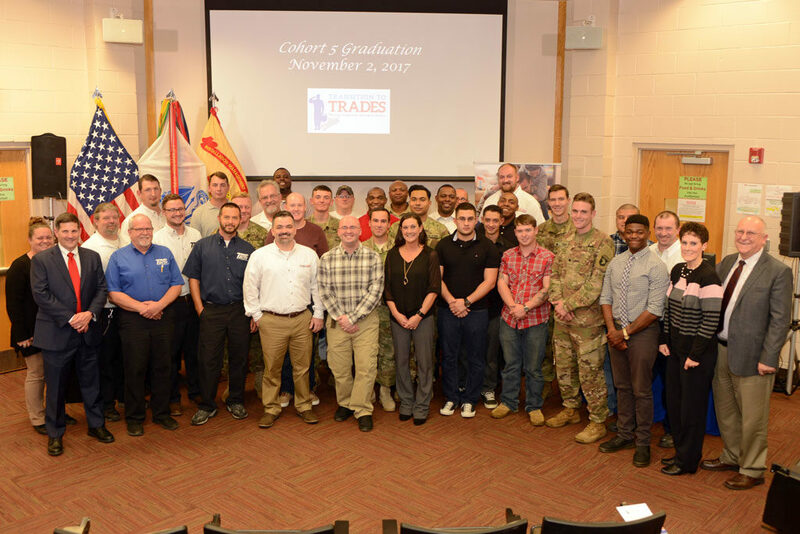 The 5th Cohort Transition to Trades graduation ceremony was held on Thursday, November 2, 2017 in the Army Education Center located at 202 Bastogne Avenue, Fort Campbell, KY 42223. Keynote speakers included Jimmy Hiller, founder and CEO of Hiller Plumbing, Heating, Cooling & Electrical, Retired SFC Anthony Kirksey, and Don Miller, Institutional Director of Total Tech, LLC. In addition, student speaker SSG Dillon Cable, Program Director Daphne Frontz and Teresa K. English, Career Skills Program Coordinator for U.S. Army Garrison, Fort Campbell addressed the audience. “We are honored that after your service to our great nation, you have chosen to serve in this industry”, remarked Jimmy Hiller, founder and CEO of Hiller Plumbing, Heating, Cooling & Electrical. “It means so much to me to be able to pass along the trade skills that have provided for my family to so many of you as you begin your new careers in the trades”. Earlier this year, Transition to Trades and Hiller Plumbing, Heating, Cooling & Electrical received congressional recognition from U.S. Congressman Marsha Blackburn’s office for their ongoing commitment to placing transitioning soldiers into full-time civilian careers. Since the program’s inception, 210 soldiers will have graduated from HVAC, Plumbing, and Electrical classes. Of those graduates, 21 have reenlisted or gone back to further their education. 131 soldiers are now employed in the industry, with an additional 10 still in final interviews and 68 working full time at one of Hiller’s 14 locations. During the previous ceremony on August 10, 2017, the Transition to Trades program also announced its expansion to place soldiers across the United States, through a contractor network provided by PRAXIS S-10. This expansion will allow program graduates additional opportunities to remain in cities of their choosing upon completion. Hiller Plumbing, Heating, Cooling & Electrical, provides residential and commercial service and repair throughout Tennessee, Southern Kentucky, and Northern Alabama. As the homeowner’s premier provider of choice with a 100% satisfaction guarantee, Hiller is Tennessee’s largest residential plumbing, heating, air conditioning, and electrical services provider. Hiller, recently named the fifth fastest-growing private company in Middle Tennessee and “Best in Business” from the Nashville Business Journal, employs more than 600 associates, boasts a fleet of 470 “happy face” trucks across 14 locations, and has responded to over 1.4 million service calls. For more information about Hiller, visit http://www.happyhiller.com or e-mail press@happyhiller.com.